This chic hotel and spa is located in the urban setting of West Sedona. The Southwest United States was once part of a vast domain of little known Spanish Kings and, at the Sedona Rouge, you will experience the sensation of royalty. Slumber atop Simmons Super plush Pillow Top mattresses, enjoy the luxury of down comforters and lambs-wool throw blankets. Feast upon modern cuisine and delicious comfort foods at Red's Restaurant, prepared meticulously by Executive Chef Ron Moler. Bask in the tranquility of the Spa and relish serenity of the mind. Explore the surrounding red-rock monoliths Coffeepot, Cathedral and Thunder Mountain. From the edge of the vast Colorado Plateau to stunning Oak Creek Canyon, Sedona is known for its exploration of the soul. Begin your exploration where mind, body and spirit come together in harmony, at the Sedona Rouge Hotel & Spa. The Sedona Rouge Hotel & Spa is an intimate collection of 77 beautifully appointed guest rooms including four suites and six spa guest rooms. Appointed with the most eclectic Spanish and Mediterranean adornments, each room enlists all the senses of the body. See the dramatic and rich colors in every room; touch the sensual linens, goose down feather duvets and breathe in the crisp, clean desert air from your patio or Euro-style, step-out balcony. Even the standard features at the Sedona Rouge are lavish. Each room also has a 32" LCD flat screen television, complimentary wireless Internet and gourmet coffee service, petite fridge, nightly turndown service and lush bathrobes. REDS Restaurant is proud to offer comfort food in gourmet fashion. After all, in a city known for its mystical healing power, there is nothing more healing than wonderful food. Red's cuisine is prepared with an American flair and complimented by an extensive wine list comprised of new and old-world wines. Red's serves breakfast, lunch and dinner, and features live entertainment Tuesday thru Saturday. REDS was acclaimed Sedona's Best Restaurant and Lounge, for the best Appetizers and Best Happy Hour by Kudo's Readers' Choice Awards. As you delve into Chef Ron's famous Mussels & Chorizo or Caramelized Sea Scallops, your taste buds will cry out for more. Meat lovers will savor Greg Norman's famous Natural Wagyu Beef, and vegetarians will marvel at the flavor of the Vegetable Spanakopita. No matter your craving, you'll leave Red's with a satisfied tummy and a satisfied spirit. 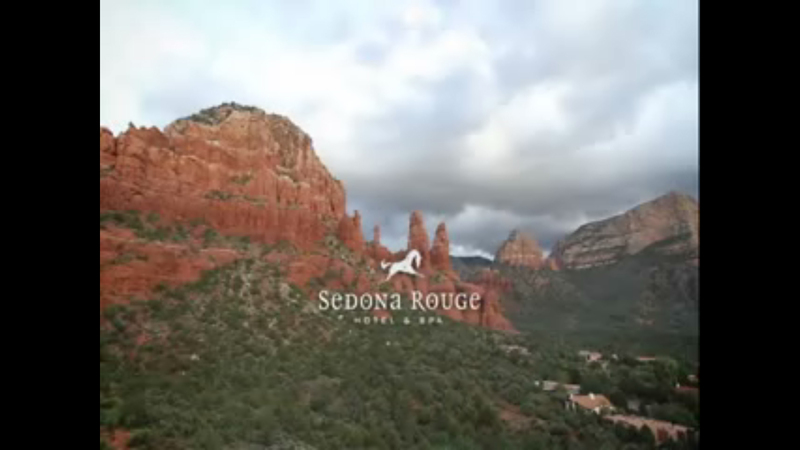 Central to the allure of Sedona Rouge is its exquisite spa designed for relaxation and rejuvenation, with ten treatment rooms, a Tranquility Lounge, hydro-therapy tubs and steam rooms. A passion for the art of well-being and customized spa services are the hallmarks of the Spa at Sedona Rouge. The Spa provides a sensory refuge, using the power of touch and natural elements to inspire you to take a step out of time relax and heal. Massage therapists perform a variety of modalities including Custom Massage, Cupping, Myofascial Release, LomiLomi, and Ayurvedic services. The Spa offers treatment rituals with rich healing butters, detoxifying wraps and floral baths locally crafted from indigenous botanicals. For radiant skin, expert estheticians customize each facial using highly effective skin care products. Famous for its Vortex sites, natural areas of enhanced energy that facilitate meditation, self realization and mind/body/soul healing, many travelers journey to Sedona to enhance their physical and spiritual well-being. The Spa at Sedona offers intuitive and wellness services such as Psychic Readings, The Rising Star Healing System?, Yoga, KinetQi and Spiritual Acupuncture to facilitate your journey to self discovery. Located within the tranquil Spa building, Sedona Rouge offers six sumptuous spa guest rooms and a romantic spa suite. Equipped with large jetted tubs, the spa guest rooms provide guests with a serene and relaxing retreat. At the Sedona Rouge Hotel & Spa, your clients and employees will be pampered in a way that is instrumental in fostering brilliant ideas. New strategies, ideas and information will flow after an inspired team building hike among the monoliths. And if doing business is your ultimate goal, the staff will make sure that every need is met without intruding upon your progress. The audio-visual department is fully equipped with the most up-to-date technology, and the spaces are intimate and inviting for up to 120 people. You may secure one of the four indoor spaces, or enjoy the great outdoors on the Observation Terrace, The Column Garden or the poolside fireplace. No detail will be missed among the 4,000 square feet of event space. Catering for your event will be in the masterful hands of Executive Chef Ron Moler of Red's Restaurant. With its contemporary American cuisine and extensive wine list, your event will be a resounding success.